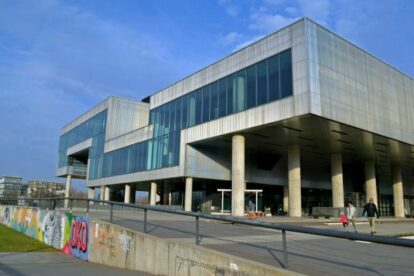 The Museum of Contemporary Art is one of those long awaited projects, a typical example of Croatian procrastination. Zagreb’s collection of contemporary art had been waiting for an appropriate display space for a long time – before this building was constructed, a small baroque palace on St. Catherine’s square was hosting temporary exhibitions, while the permanent collection was kept in archives. It’s a pity that such an impressive collection (now comprising 5000 works, mostly of Croatian and international artists after 1950) was kept away from the eyes of the public for so long, but the waiting was well worth it. In 1998 a decision was made to build a new museum in Novi Zagreb neighborhood, and only in late 2009 was a new building opened, two years after the original deadline. The project which won the competition, by the architect Igor Franić, pays homage to the leitmotiv of maybe the greatest Croatian modernist painter, Julije Knifer: the meander. Knifer extensively used the shape of meander in his opus in endless variations and with various techniques and thus the meander has become one of the epitomes of Croatian modern art. The building ingenuously uses this shape on many levels. I often visit this museum – whether it’s to roam and rediscover classics of Croatian and ex-Yugoslavian modern art or see one of the temporary exhibitions (which are excellently curated) or even a jazz concert or an art-house movie in the museum’s multimedia hall. Admission is free every first Wednesday in a month.